This summer, I was fortunate to participate in Project Puffin through the National Audubon Society. Project Puffin began in 1973, working for seabird restoration off the coast of Maine, with a focus on restoring native puffin populations. 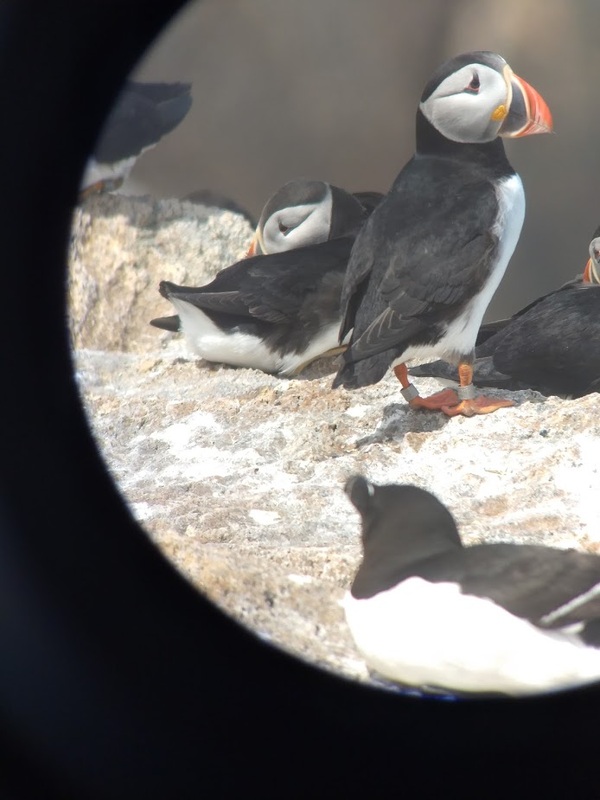 Puffins and other seabirds were hunted heavily in the 19th century for feathers and meat, resulting in only 2 colonies surviving off the coast of Maine. 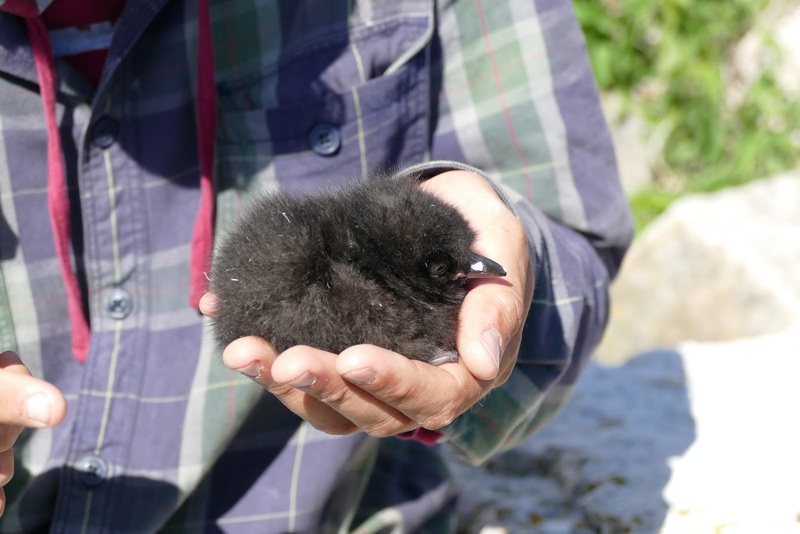 Project Puffin began restoration efforts by bringing puffin chicks from Newfoundland to try to repopulate islands where the birds originally ranged, and the group has been working towards that goal for over 4 decades with great success. 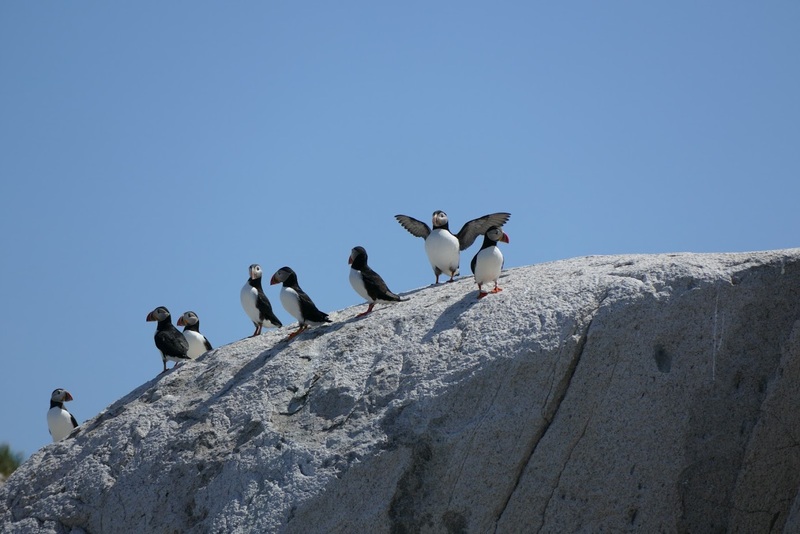 As a volunteer aviculturist, I was assigned to Matinicus Rock Island, one of 7 islands that Project Puffin stations researchers on during the seabird breeding season each summer. The trip started off slow – our day of departure, the waves were too high to make a safe landing. Thankfully, the next day (Saturday June 9) was calm and we boarded the local ferry for our first leg of our journey. Four hours of travel on three different vessels (a large ferry, a medium lobster boat and one tiny dory we made it to Matinicus Rock! The moment I stepped on dry land, the first thing I saw off was a ledge full of puffins! 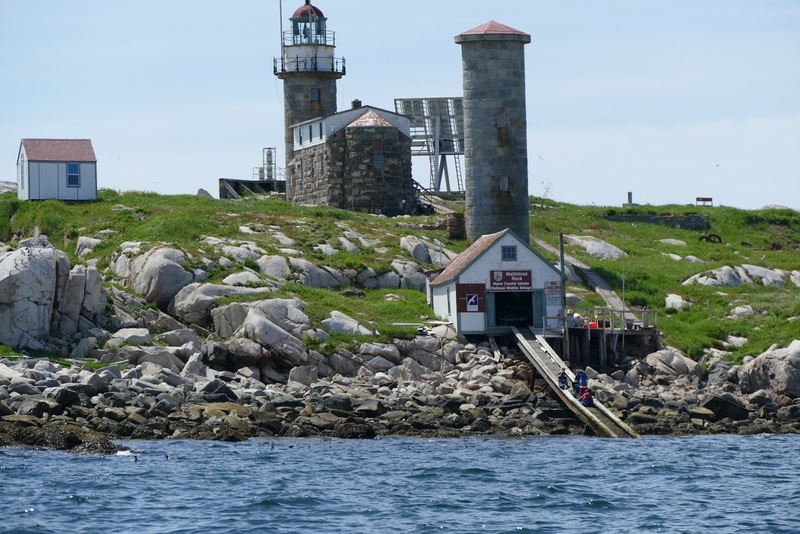 Our first task was to lug all of our supplies for the next three weeks up to the lighthouse. My hands were full as I ducked and dodged screaming terns as they dive-bombed my bare head. I headed back through the gauntlet for another load while trying to remember where I packed my hat. The following days were spent working with the full time research team to get the most out of the short field season. 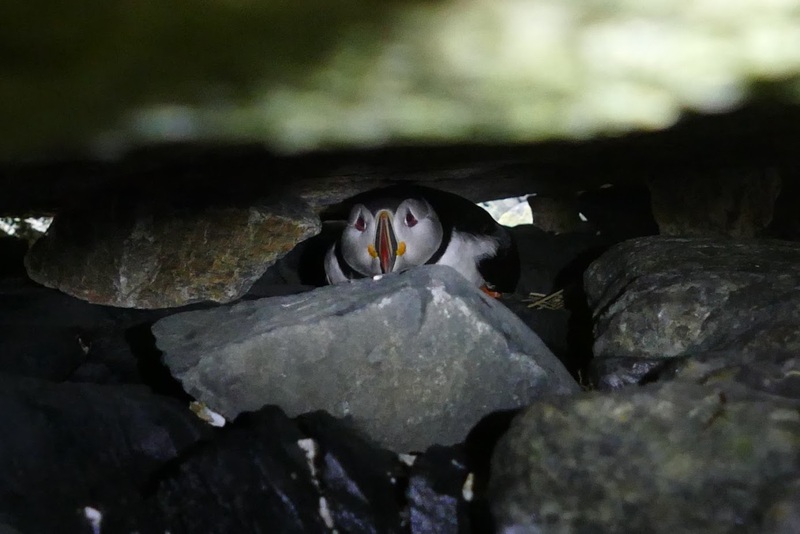 Puffin burrows must be checked for eggs and pufflings. 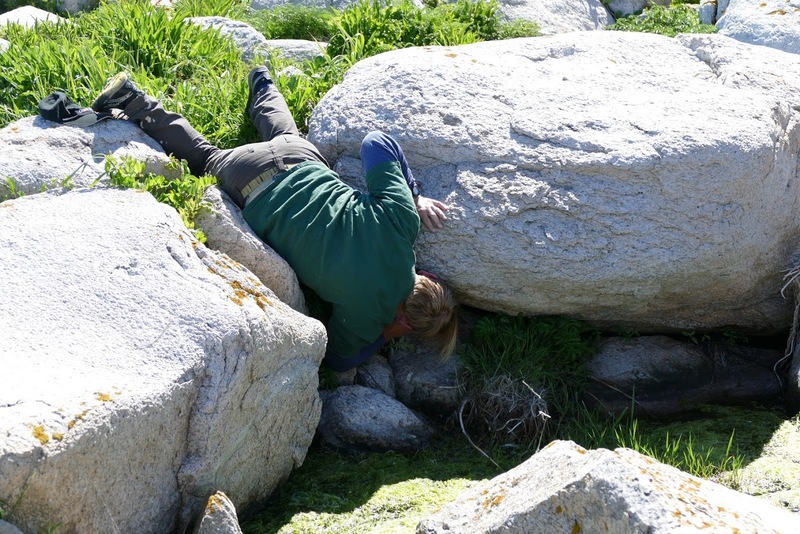 Burrows are not easily accessed by big clumsy humans, and this required a lot of squeezing and bending and contorting to get a look inside. 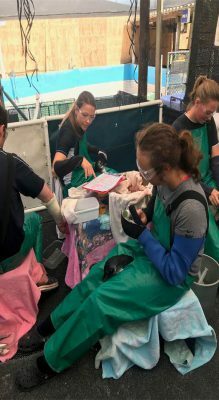 Puffin chicks that were reachable were gently removed and fitted with a numbered band, then weighed and measured before being returned to their burrows. 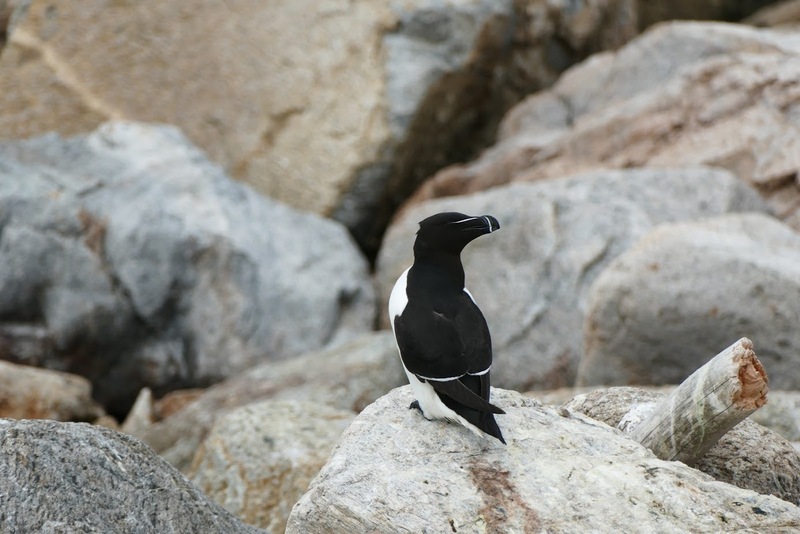 We also did the same for razorbill chicks, another burrowing species of seabird from the Alcid family. Another bird that I became very familiar with during my time on the island is the tern. 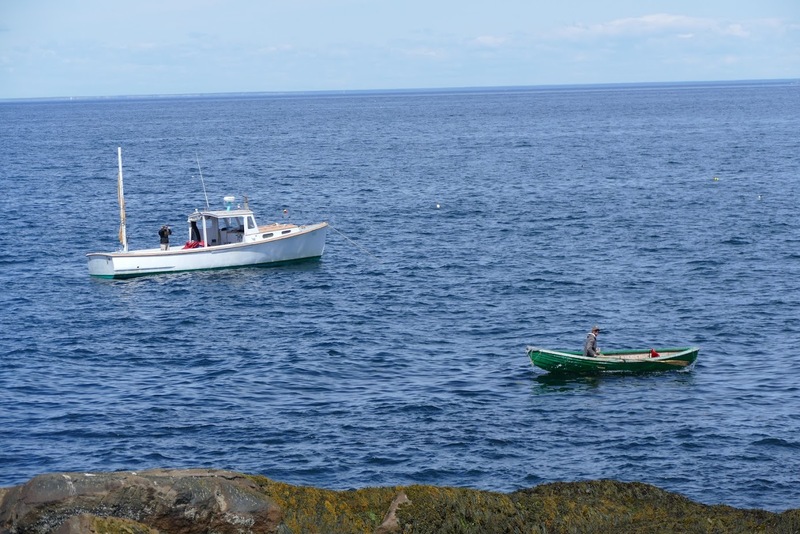 Both Common and Arctic Terns nest on the island, and one of the many tasks we performed was a multi-island census of the populations in Maine. We walked the entire island in a grid pattern to count every nest and the number of eggs in each. The adult terns were constantly overhead, reminding me to be sure and grab my hat! Different nests were picked out for various studies and marked. 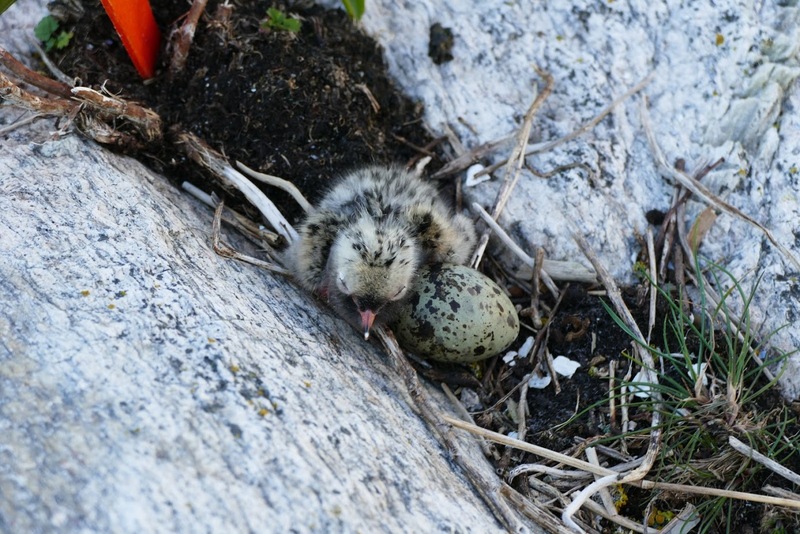 Once the chicks started to hatch, the study-specific birds were also banded and weighed to monitor their development. Any spare time we had was spent in bird blinds, performing counts. Sitting in a bird blind on an island in the Atlantic is a unique experience. There is a spotting scope set up in a tiny box (with a chair if lucky, a bucket if not). 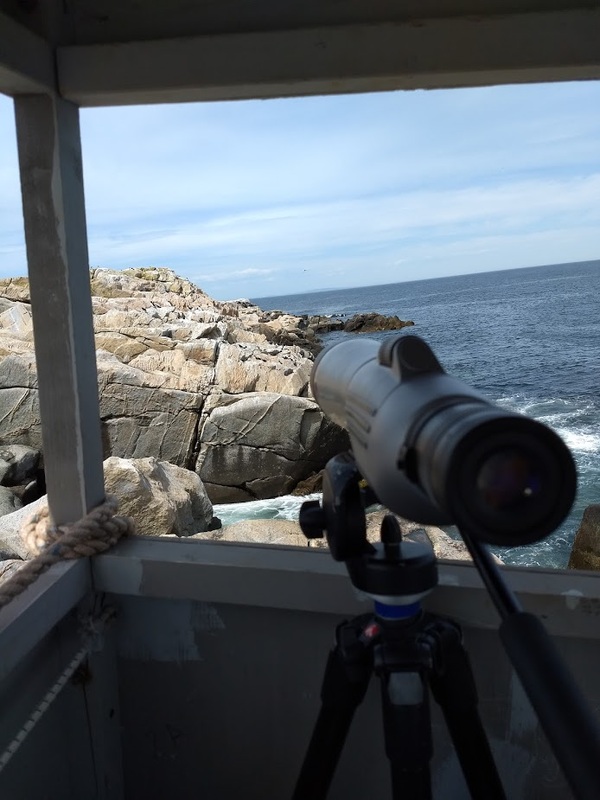 You sit, perched on the edge of a rocky precipice, wind howling at your back, waves crashing below, all the while trying to read the 4 little characters on a skinny metal leg band through the scope. Sometimes you get a perfect view, other times it’s just a glint of silver before the band disappears under feathers or the bird flies off. At the end of the day you trudge back to the lighthouse with a sore neck, tingly feet, and cold cheeks, all for the sake of research. I loved every minute of it. 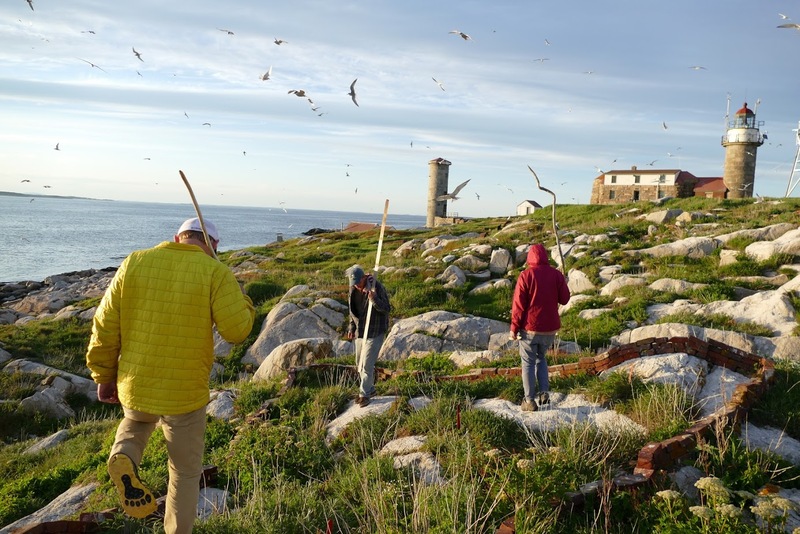 We also banded Leaches Storm Petrels, counted Common Eider nests, checked guillemot burrows, and performed daily counts of every bird on the island from the best vantage point – the lighthouse! It was quite a view from up there! 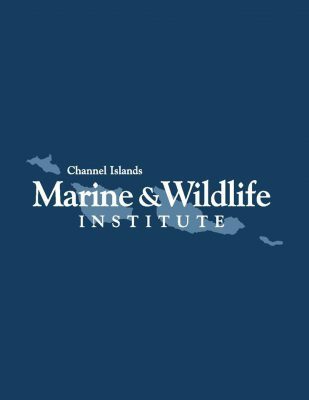 This April and May, Zookeepers Becky and Julie will be heading to Channel Islands Marine & Wildlife Institute (CIMWI), in Santa Barbara, California, to help rescue and rehabilitate sick, injured, malnourished, orphaned, entangled and oiled marine mammals. 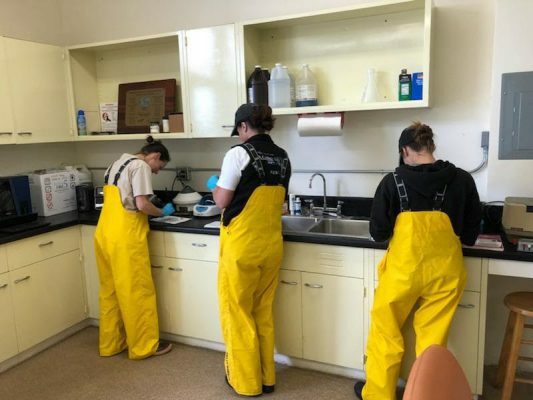 CIMWI is an all-volunteer run organization, so Becky and Julie will actively participate in all aspects of rehabilitation, including observing patients, following vet treatment plans, feeding, and cleaning the holding and treatment areas. 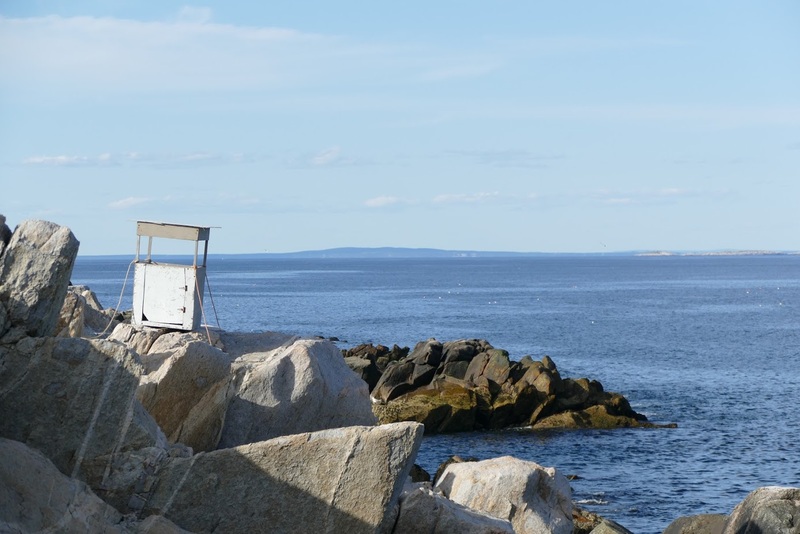 If the timing is right, they could have a chance to be part of releasing a healthy rehabilitated marine mammal back to the wild. Check back in the coming months to read about their experiences. 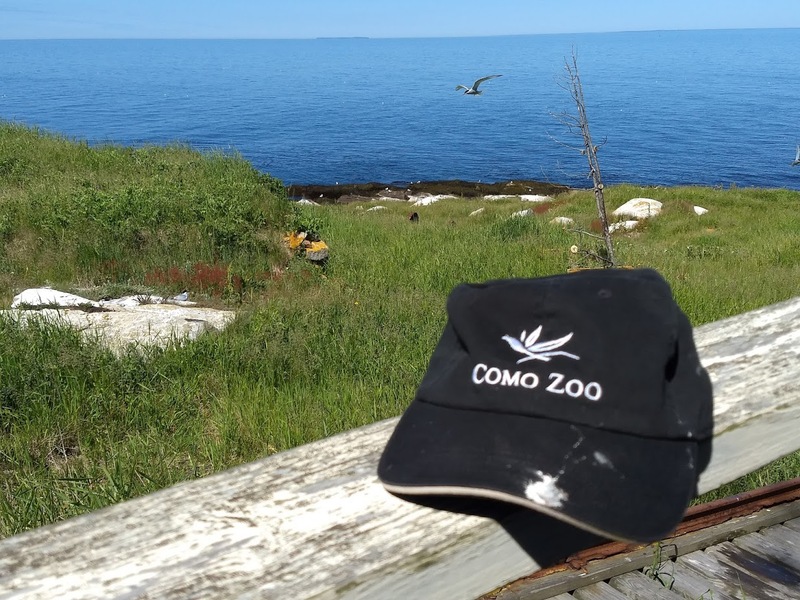 Thanks to Como Friends for funding their trips to help give marine mammals a second chance at life! 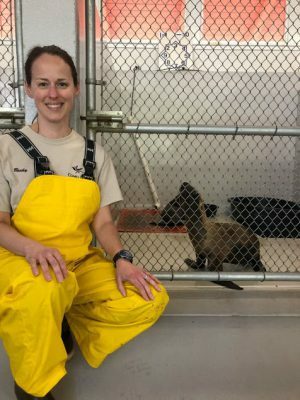 Zookeeper Becky is pictured here on her second day assisting CIMWI with their rehabilitation efforts. In the background, you can see patients #16 and #23. 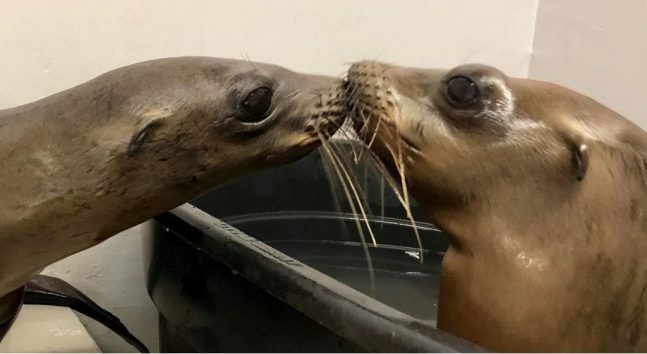 These are both California sea lion pups who were rescued because they were malnourished, dehydrated and underweight. 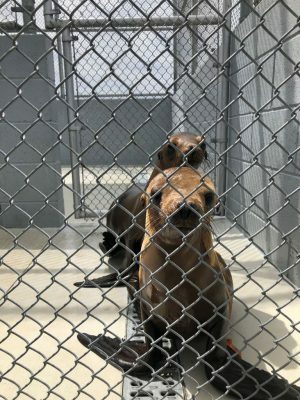 California sea lion pups are born in the middle of June, so these pups are about 10 months old. CIMWI’s goal is to rescue, rehabilitate and return these animals back to the wild. Marine mammals can get stranded for a variety of reasons. 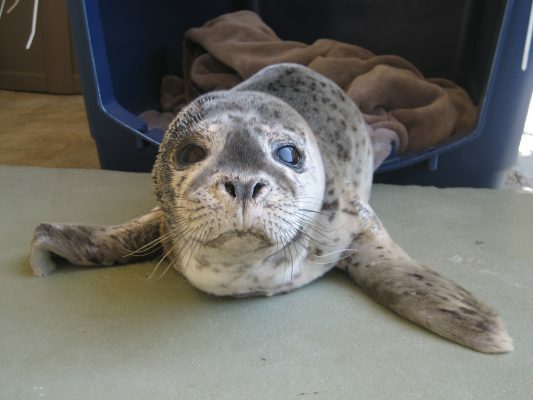 Diagnostic testing is an essential part of the rehabilitation process for the marine mammals. 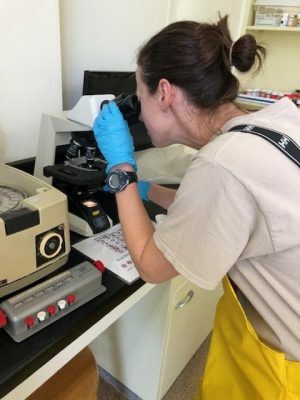 Zookeeper Becky is pictured here examining blood cells from patient #36, a California sea lion pup. 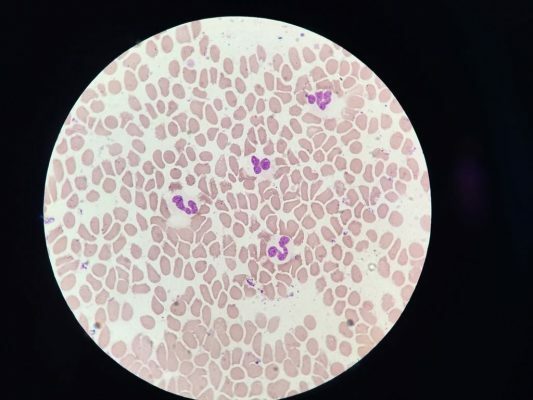 Looking at blood cells allows the veterinary team to determine if a patient has an infection, inflammation, parasites, or a combination of these issues. This information helps them determine the possible source of infection or inflammation and helps direct the course of prescribed medical treatment. The medications are inserted into a fish and fed to the patients with grabbers (tongs). This helps reduce the risk of habituating these wild animals to eating from people’s hands. CIMWI rehabilitates marine mammals with the goal of releasing them back to their natural wild environment. 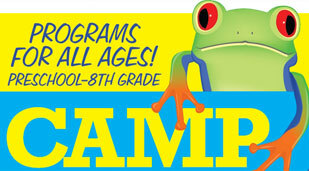 Jaya wants you to know that last year Como started participating in an exciting program. 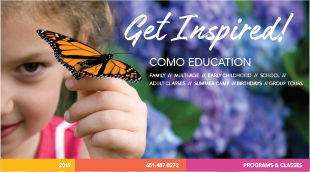 With funds from Como Friends, the Como Zoo and Conservatory enrolled in the RightCycle Program. Started in 2011, The RightCycle Program has helped customers divert over 300 tons of waste from landfills. Over 150 customers/organizations currently participate in the program. To learn more about this program or to get your company on board follow the links. 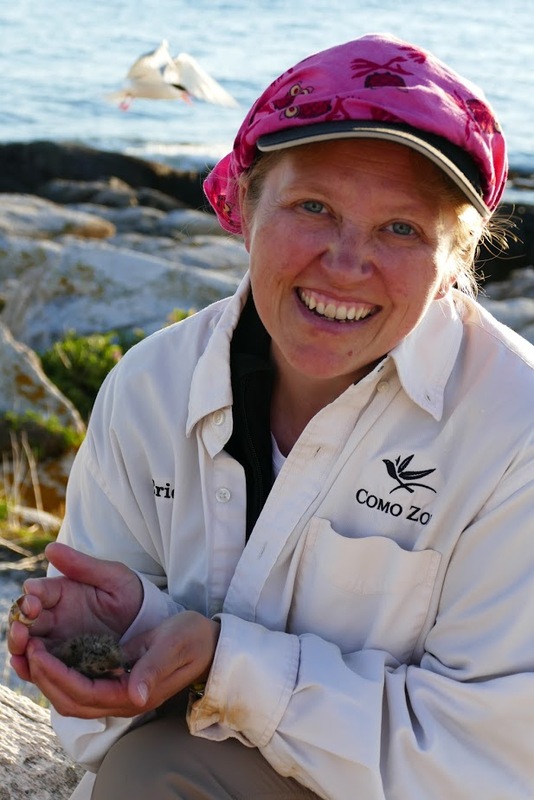 As a Conservation Champion, I spent two weeks in Cape Town, South Africa with the South African Foundation for the Conservation of Coastal Birds (SANCCOB). 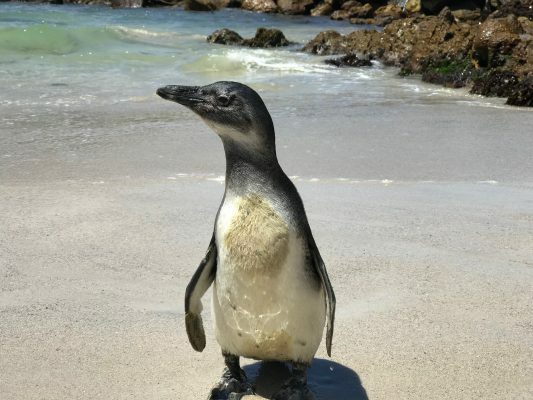 African penguins are endangered and have breeding colonies at approximately 28 sites between Namibia and South Africa. 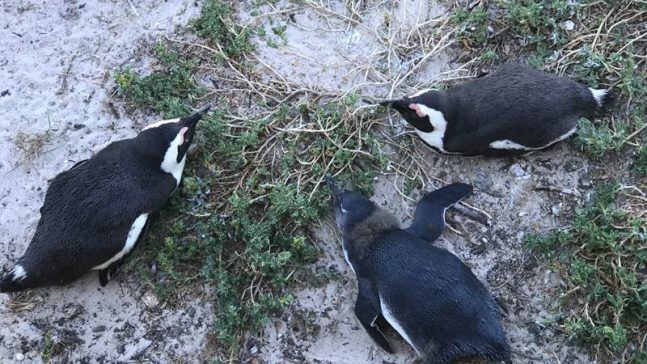 In fact, the number of African Penguin breeding pairs has declined from 80,162 pairs in 1979 to 25,100 pairs in 2015. That is a decline of greater than 50% in just 38 years. Reasons for this decline include: over-harvesting of fish, climate change, human conflict, and oil spills. 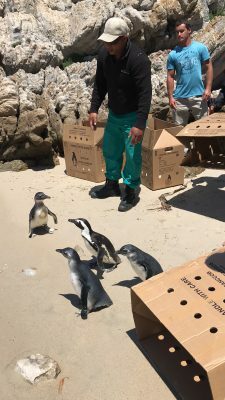 In order to help boost their numbers in the wild, SANCCOB treats sick, injured, and abandoned African Penguins (as well as other sea birds) and releases them back into the wild. 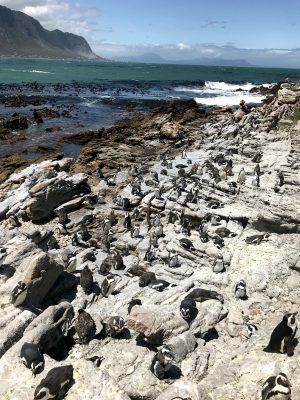 Not only do they rehabilitate and release African Penguins but they have an entire research department dedicated to tracking and studying the birds after they are released. 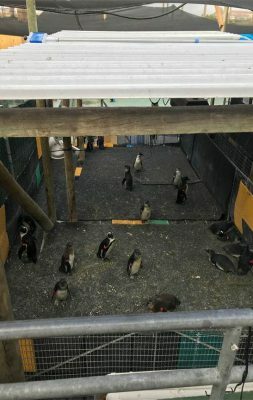 This was my first day at SANCCOB and I was told that I would be working in pen 3 with the birds that were getting ready for release. 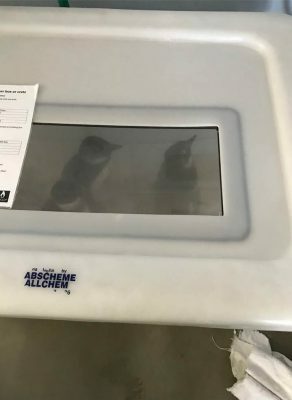 These birds received three feedings per day. 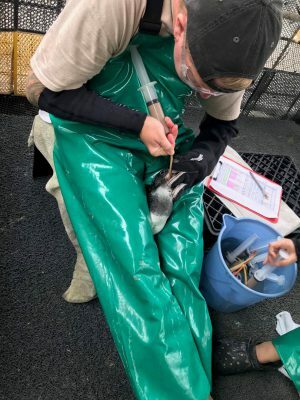 Most of the birds needed to be force fed sardines and some of them required extra tube feedings to make sure they were at a healthy weight prior to release. It was quite the learning curve. The penguins at Como are a little less feisty than the wild birds. Penguin #455 (we called him Patrick) came to SANCCOB with muscular issues and is the adult furthest to the left. 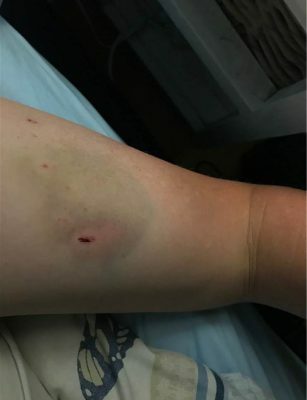 He gave me a few cuts and bruises before his release. 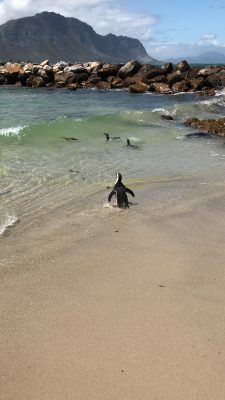 I went out to the Boulder Bay Penguin Colony. The two adult penguins, in the photo below, were laying near their chick. The chick was probably a few weeks old and still losing the chick “fluff” which are the non-waterproof down feathers they have when they have first hatched. The birds at this stage are called “blues” because the waterproof feathers growing in have a blue hue to them and will change to brownish/white as they become juveniles. 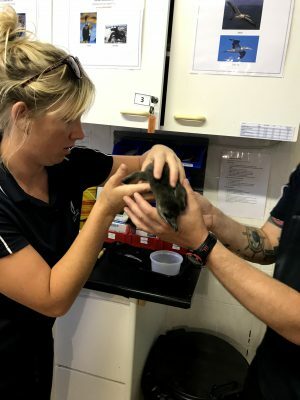 A penguin had been admitted earlier in the year with injuries to the neck, possibly Cape Fur Seal bites. The wounds looked to be healing but the vet needed to open the stitches and make sure all of the infection was clear. I was able to observe and participate in this surgery. 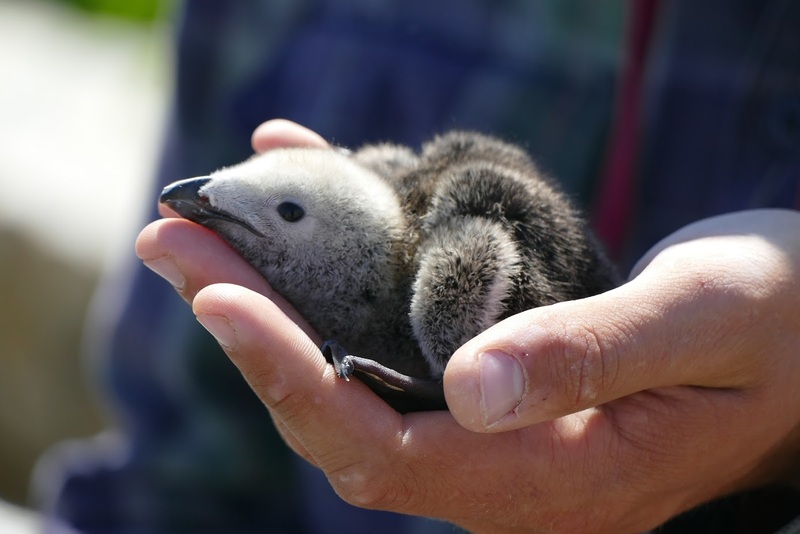 Good news for this penguin, the infection was gone and this bird would be able to be released in the near future. 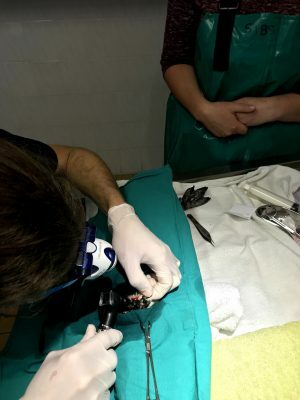 Just before surgery there were 40 chicks admitted from the colonies. The one in the photo is getting a quick physical before being taken to the chick rearing unit. Earlier this month, I took part in the Borneo Orangutan Survival (BOS) Foundation’s “Year of Freedom” campaign as a 2017 Como Conservation Champion grant awardee. 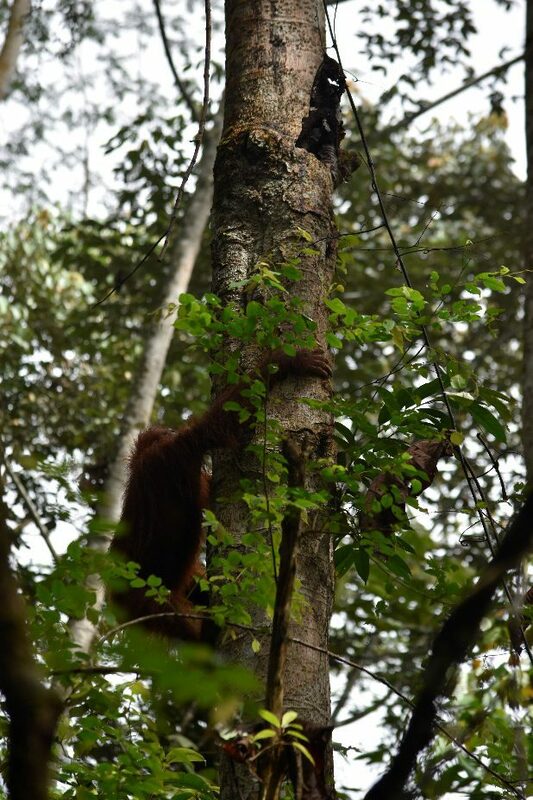 BOS Foundation currently cares for more than 600 orangutans between two rehabilitation centers on the Indonesian side of Borneo: Samboja Lestari in E. Kalimantan and Nyaru Menteng in C. Kalimantan. 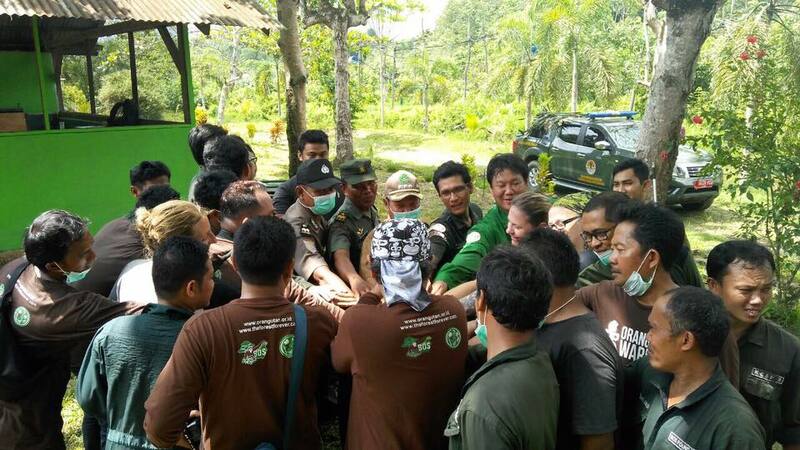 Now that suitable land has been secured, the goal is to reintroduce 100 orangutans to protected forests, and release 100 onto pre-release islands to complete their forest training before reintroduction by the end of this year. 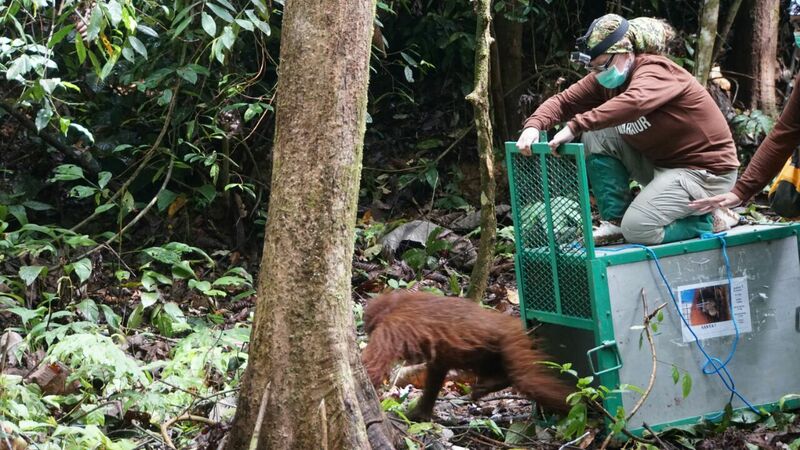 This will alleviate the overcrowding at the centers and fulfill their mission to rescue, rehabilitate, AND release Bornean orangutans- a critically endangered species- back to the wild. I have been fortunate to visit and volunteer at several orangutan rescue sites on Sumatra and Borneo (including Samboja Lestari) with the support of Como Park Zoo & Conservatory and Como Friends in the past. My focus on those trips was on the orangutans that must remain permanently in human care due to medical or behavioral reasons. Typical projects include enclosure design and propping, enrichment, teaching husbandry workshops, and training caregivers on the use of positive reinforcement techniques when working with orangutans. 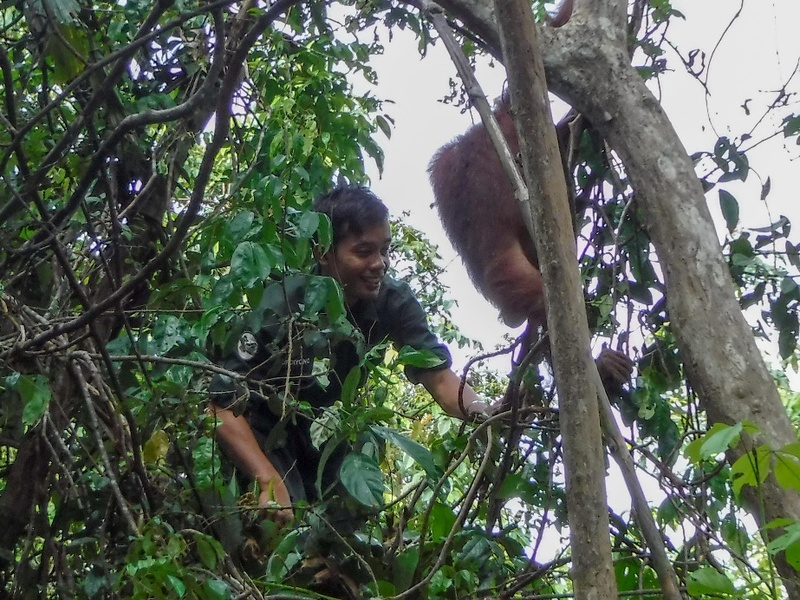 This year, I did something very different… I was invited by BOS Foundation CEO, Dr. Jamartin Sihite, to go on a journey to release a group of rehabilitated orangutans back into the wild – a once-in-a-lifetime opportunity and dream for any orangutan zookeeper! After 30 hours spent in airports and on airplanes, I arrived in Balikpapan in E. Kalimantan, Indonesia, on the island of Borneo on November 29th. From there, it is about a 45-minute drive to BOS Foundation’s Samboja Lestari center. I brought along Ronda Schwetz, Director of Henry Vilas Zoo. She and I have been traveling to Southeast Asia together on an almost annual basis since 2010. 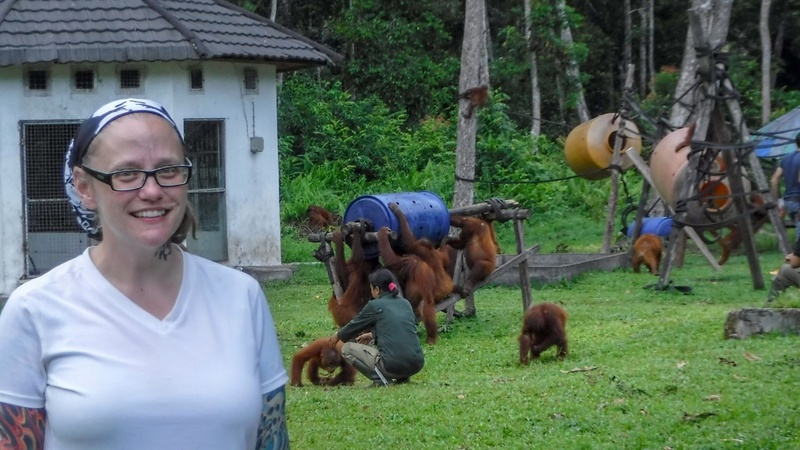 Along with serving at our zoos, she is the Field Advisor and I am the Vice Chair of the Orangutan SSP – the species management program for orangutans in AZA-accredited zoos. I also serve as the International Orangutan Studbook Keeper. 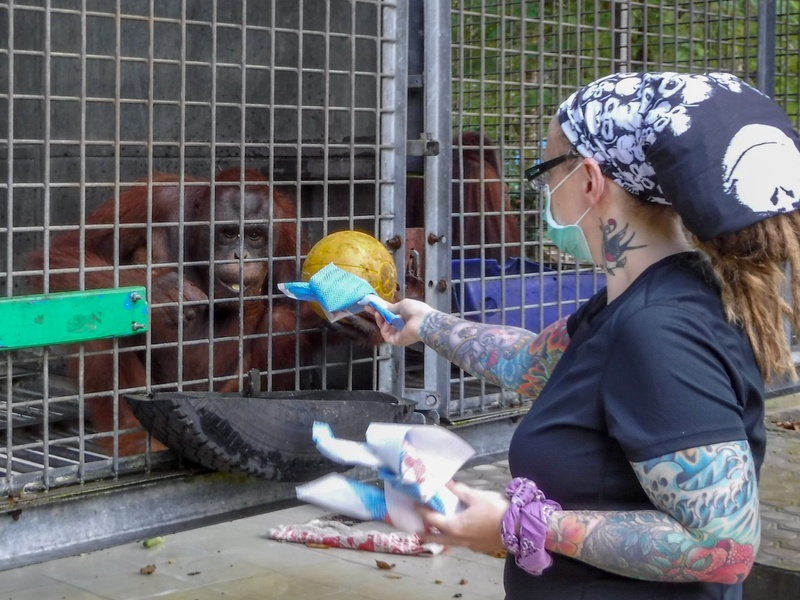 Ronda started a keeper exchange program for rescue centers and zoos in Malaysia and Indonesia and Como has supported my assistance with this program. We make a great team! 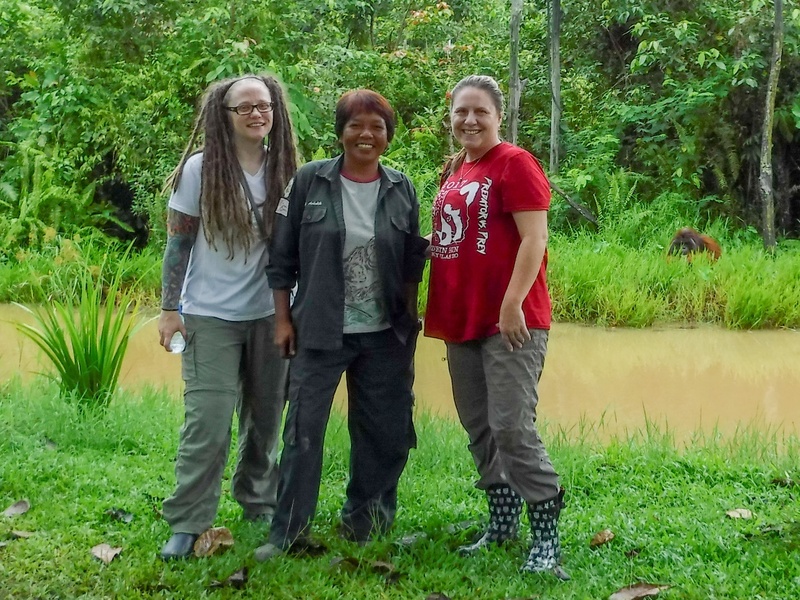 Megan and Ronda reunited with BOS Foundation Samboja Lestari staff member Wiwik Astutik… and orangutan “Romeo” (in background) both of whom we worked with in 2010. 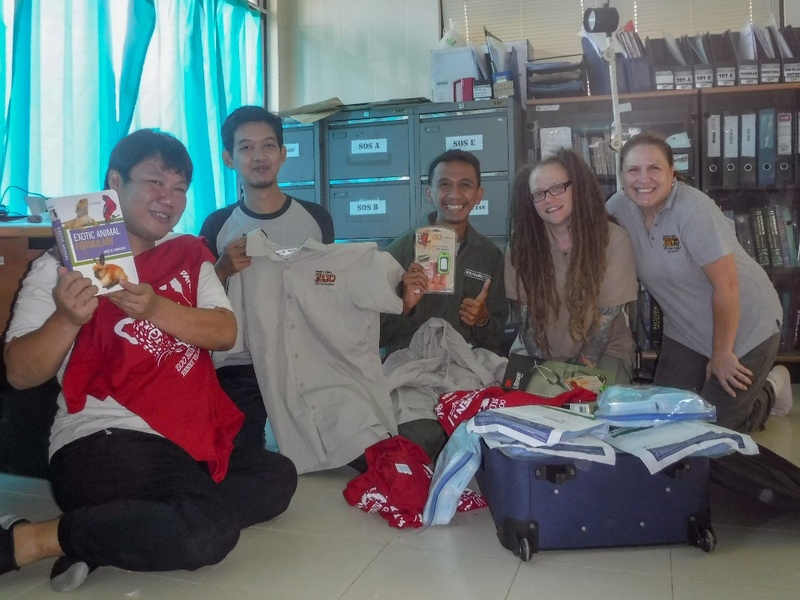 Our first order of business was delivering over $1200 worth of medical donations to the veterinary clinic at Samboja Lestari. Items included stethoscopes, pulse oximeters, formulary references, surgical supplies, and some apparel from our zoos. 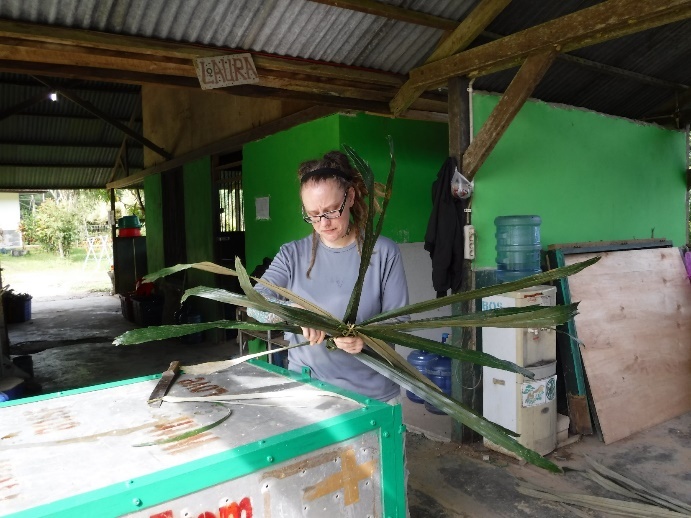 We underwent a quarantine period at Samboja Lestari to ensure that we were healthy and not at risk of transmitting any illnesses to the orangutans being released. BOS Foundation also ensured that we were fully vaccinated and tested negative for tuberculosis since orangutans can catch any diseases that humans carry. 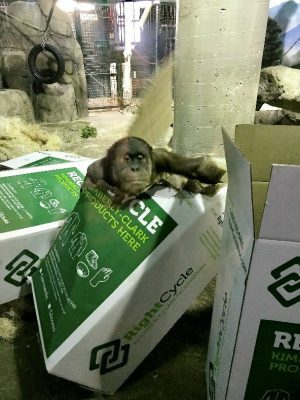 This is something that we are always aware of at Como when working with primates – especially great apes during cold and flu season. 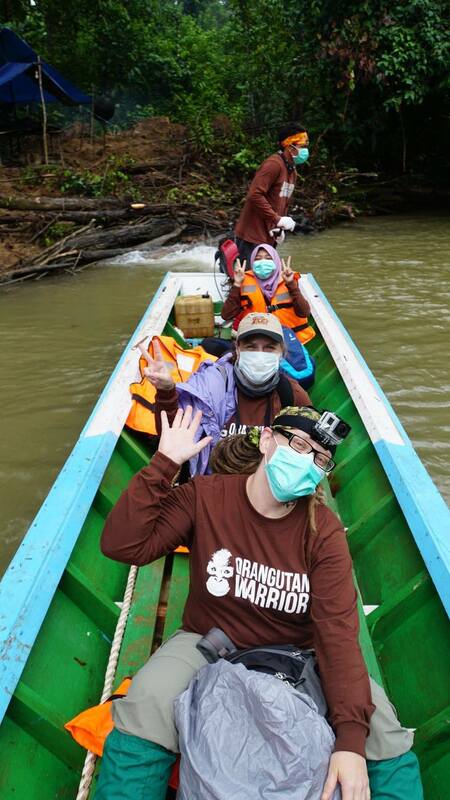 We spent our days of quarantine touring the new man-made islands, Special Care Unit, and observed the immobilizations and transfers of three orangutans (one of which had been in a cage for 20+ years and that we met during our 2010 trip) to one of the onsite man-made islands. We also created and delivered enrichment to some of the ~150 residents cared for at the center. 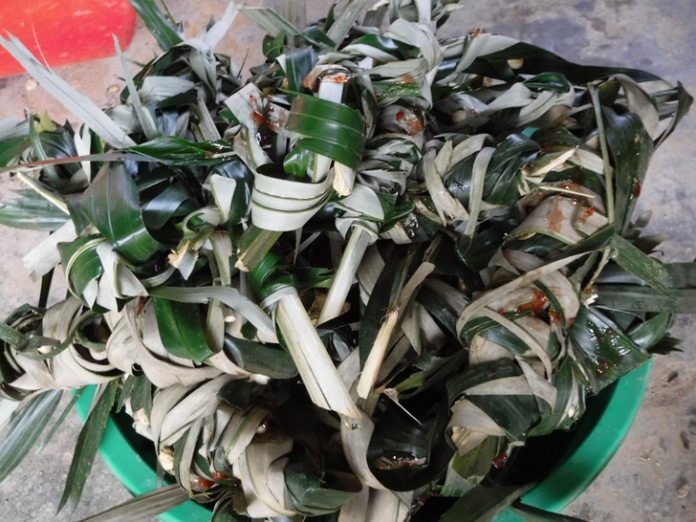 Woven palm fronds with nuts and seeds inserted, smeared with jam. We also had the opportunity to observe “Forest School” training for various age groups. Orangutans stay with their mothers for up to 10 years. She teaches them everything they need to know to survive in the wild. 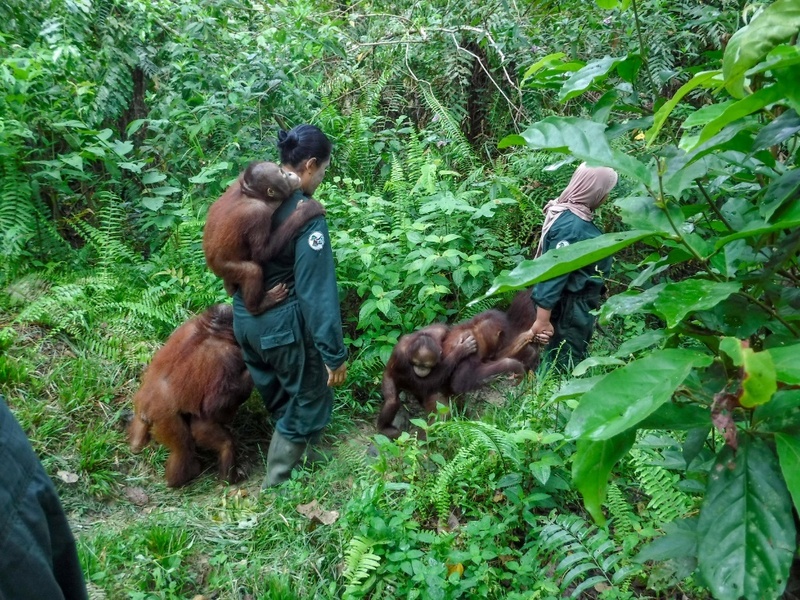 Orphan orangutans are taught these life skills by human “baby sitters” at the center. These skills include nest building, searching for edible fruits and plants, as well as identifying potential predators. 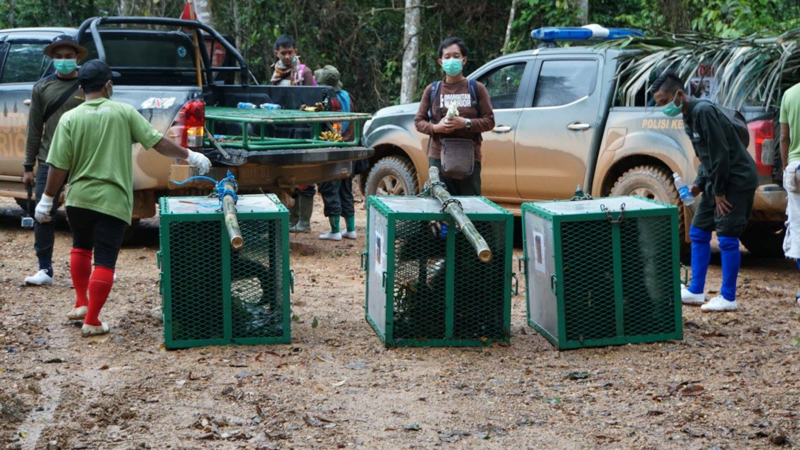 Orphans leaving their night cages to spend their days in the forest. Nest Building 101 as taught by a caregiver. Then on December 4th, we departed for the release trip. 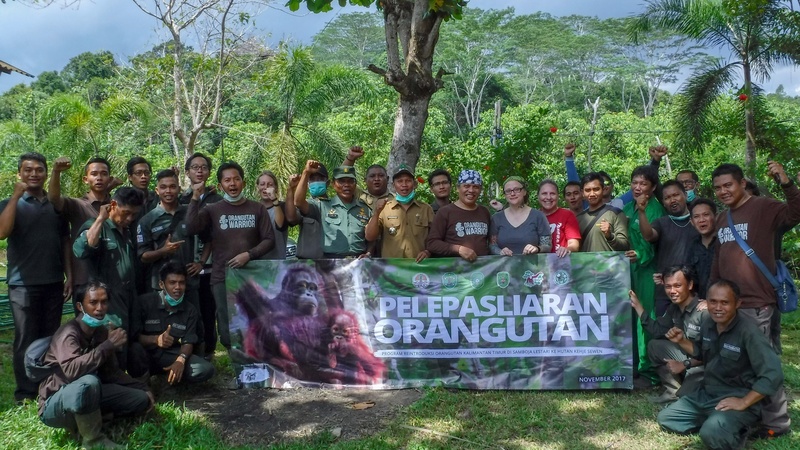 Following a ceremony with local officials, we traveled to the capitol of E. Kalimantan, Samarinda, for a second ceremony with wildlife officials, witnessing the signed authorization for the release of the five orangutans and participating in a media event. 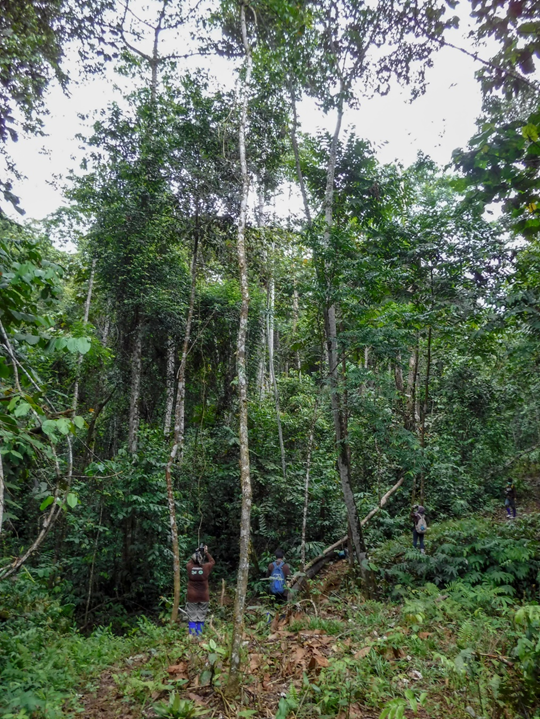 Then we set off for the 20-hour journey to Kehje Sewen- an 86,000-hectare protected rainforest that is home to 80 rehabilitated BOS Foundation orangutans. Team cheer before heading out. 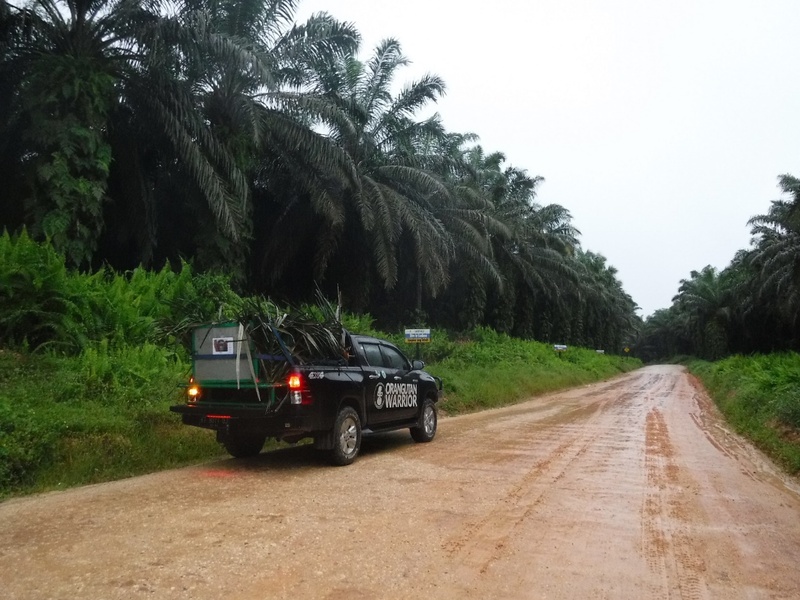 Driving through palm oil plantations to reach the release site. The cutting down of forests for timber and conversion of land to palm oil plantations is one of the biggest threats to orangutans as they lose their habitat. Coal and gold mining along with poaching, also threatens their existence Go to http://bit.ly/2zNa8ls to learn more about the situation and what you can do as a shopper. Unloading where the road ends…. …. 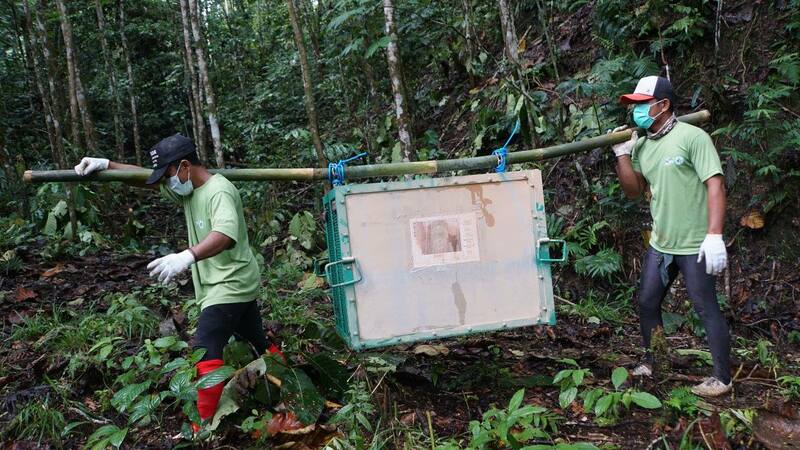 and carrying the crates through dense, leech-infested rainforest. Visiting and assisting with enrichment at Nyaru Menteng (made famous on Animal Planet’s “Orangutan Island”).